In a move to bring engineers, technicians, designers, manufacturing experts and suppliers closer together, Toyota Motor Corporation expanded its Ann Arbor, Michigan R&D Center. Toyota has long invested in continuous improvement of vehicle design and efficiency. They feel that this new collaboration will improve even more by having all these roles working together in closer proximity. The Ann Arbor facility represents a $154 million expansion from the automotive leader. 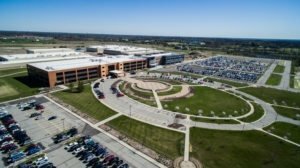 In the heart of the auto industry area in Michigan, this R&D center employs about 1,600 employees. Toyota is recruiting, filling open engineering positions. Future mobility will be one area of focus for the center. Ride-sharing services and self-driving cars are included in the mobility profile. Parking structures and office buildings that can support solar panels for renewable energy production. Our Elmhurst Sales, Finance and Service Teams are excited about future Toyota designs, technology and unimaginable possibilities. For over twenty years as your Chicagoland Toyota Tahoe dealership, we have proudly offered quality Toyota vehicles. Our Tahoe dealership has the most customer-focused, knowledgeable and friendly staff. Our Sales Team is known for their expansive knowledge of all the Toyota models. They also stay on top of our wide selection of used vehicles. They will invite you to take a test drive of any vehicles we have in stock. Our Finance Team is well-versed on financing options for every budget. They will inform you of dealer incentives and explain financing plans best for you. After purchasing a new or used vehicle, your vehicle will be expertly serviced by our factory-trained Service Technicians. Or, bring in your current vehicle for service. We service all makes and models. Elmhurst Toyota has a great selection of new Toyotas and used vehicles. You can see our inventory and the latest new vehicle incentives at our website: https://www.elmhursttoyota.com. See why our dealership is the best one for you. Stop by and meet us – you will be glad you did!